Burton remain just a point off the League Two top spot after surviving a second-half fightback to beat struggling Mansfield. Jimmy Floyd Hasselbaink's side are second while the Stags are four points ahead of the bottom two in 20th. Burton's Matt Palmer scored from a free-kick before Kelvin Maynard doubled the lead with a header. Michael Raynes's header pulled a goal back for the visitors but they were unable to secure a point. "Take nothing away from Mansfield, they came here and had a game plan. "They looked at us properly. They tested us, and tested us a little bit differently to Shrewsbury last week by being more direct, and it caused us problems. "It was not a classic. But you're not going to go through a season with all them games being easy and beautiful. "It's not going to happen. Sometimes you have to really dig in as a team and work hard." "Two defensive errors have cost us the game today. "People have held the hands up in the dressing room, but we have lost a game of football and we are not in a position where sorry is good enough. "I felt we were unlucky to get a point after our second-half performance. "We had enough chances, and the frustrating thing is we've come to a top-of-the-table team and took the game to them, and with a little bit more ruthlessness, it might have been different." Match ends, Burton Albion 2, Mansfield Town 1. Second Half ends, Burton Albion 2, Mansfield Town 1. Substitution, Mansfield Town. Danny Fletcher replaces Callum Elder. Jacob Blyth (Burton Albion) wins a free kick on the left wing. Foul by Vadaine Oliver (Mansfield Town). Attempt saved. Jacob Blyth (Burton Albion) right footed shot from the right side of the box is saved in the centre of the goal. Foul by Richard Ravenhill (Mansfield Town). Attempt missed. Michael Raynes (Mansfield Town) header from the centre of the box is close, but misses to the left. Substitution, Burton Albion. Lucas Akins replaces Stuart Beavon. Matthew Palmer (Burton Albion) wins a free kick on the right wing. 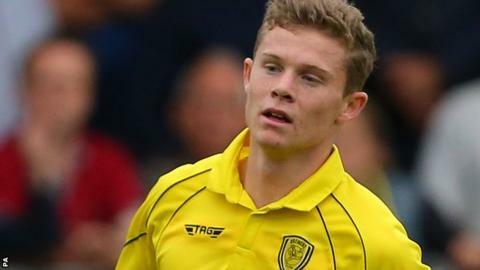 Delay in match Stuart Beavon (Burton Albion) because of an injury. Substitution, Mansfield Town. Matthew Rhead replaces Reggie Lambe. Attempt saved. Reggie Lambe (Mansfield Town) left footed shot from outside the box is saved in the centre of the goal. Attempt missed. Ritchie Sutton (Mansfield Town) right footed shot from outside the box is high and wide to the right. Corner, Mansfield Town. Conceded by John Mousinho. Attempt missed. Martin Riley (Mansfield Town) left footed shot from a difficult angle on the left is close, but misses to the left. Darragh Lenihan (Burton Albion) is shown the yellow card. Foul by Darragh Lenihan (Burton Albion). Foul by Kelvin Maynard (Burton Albion). Martin Riley (Mansfield Town) wins a free kick in the defensive half. Corner, Burton Albion. Conceded by Callum Elder. John Mousinho (Burton Albion) wins a free kick on the right wing. Kelvin Maynard (Burton Albion) wins a free kick in the attacking half.